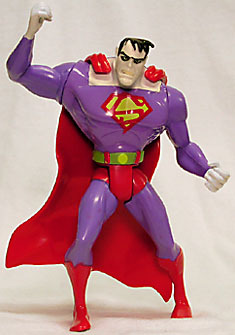 Fanboys around the world squealed in delight when Kenner (the classic company that many of us can thank for making us the collectors we are today) announced the very first ever Bizarro action figure in 1997. Sure, it was to be for Superman: The Animated Series, but hey, we all wanted the iconic villain to add to our collections. However, when he and the rest of S:TAS wave four failed to appear at Toy Fair, it was revealed the entire wave, which also included the much-desired fan favorites Supergirl and Metallo figures, would be available only outside of the U.S. Well, thankfully Diamond Comics Distributors heard our pleas and struck a deal to distribute the wave exclusively in the U.S. The production run was small and prices high compared to the previous waves, but it was still better than having to resort to scoring the figures as imports on the secondary market. Though he's in an awkward pose, the sculpt is pretty on-model, especially for "those days." The main problem with it, design-wise, are they oddly spaced and staggered legs which conflict with the cape to such a degree that a "good" pose is pretty unattainable. Moreover, the figure suffers the curse of an "action feature." 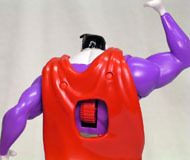 In this case, one can spin a wheel, protruding through a hole in the cape, on Bizarro's back, causing his arms to spin wildly and bizarrely, preferably (according to the desires of the designers) while holding his accessories. Bizarro's two accessories are of a broken off wheel and small portion of axel (the wheel does turn with mild effort applied) and some random gear ripe for Superman hittery. 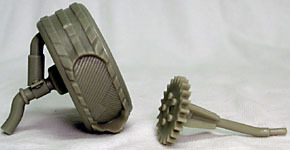 Unfortunately, the pieces make the weak arm mechanisms bottom-heavy and render the play action difficult to achieve menacingly. So basically, he looks "bizarre" with and "bizarre" without. Also, the play feature basically removes the arms as real points of articulation, leaving only the T-crotch hips, waist and neck so the figure has four points of articulation (or six "from a certain point of view," to quote Ben Kenobi's infallible logic in Return of the Jedi). Paint is... well the actual applications on my figure are fairly mediocre, but I'm not sure if that was a problem, for the entire run or I just got unlucky. The biggest note to mention is the muted colors on Bizarro's costume. The red is slightly more darker than Superman's, but the blue is very pale and almost purple. Sadly it's too gray-ish to be either show-accurate or the fan-preferred purple. I still like it, because it is definitely not like Superman, and that's how I prefer my Bizarros. Related to that, what I really like about the Animated Bizarro is that his S shield is "crazy" (or, daresay, bizarre). Obviously it's not the trademarked backwards "S" we all prefer, but I really like its difference from the Superman "S" and really backs up the notion of Bizarro as a failed duplicate. Going with that premise, something I really like about the figure/design is the augmented proportions. As, essentially, a faulty clone, I like that Bizarro is really just a "ballpark-ed" Superman, so everything about him should be "off." Wrong colors, wrong body, wrong symbol, wrong face... right on! Wait, that's not irony, it's just a coincidence. Damn you, grammar! Maybe that is irony in Bizarro World. Does anyone actually know what irony is? Tell us on our message board, The Loafing Lounge.